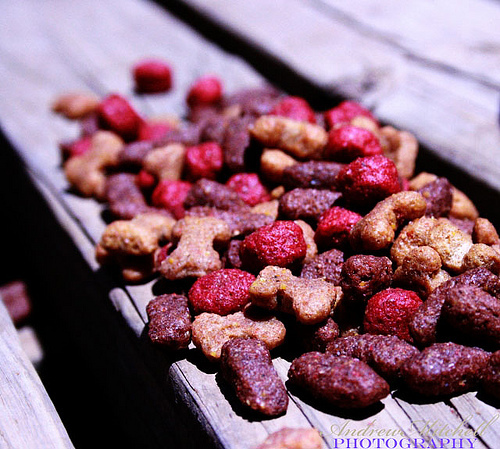 What is the Best Dog Food ? What is the Best Dog Food for Pitbulls? You love your dog. After all, a dog is humanity’s best friend and you want to care for him or her just as much as they love you. And so, you want to provide them with the best food possible. After all, you don’t like eating bad food, so why should your dog? Your first thought might go to looking for grain-free options. Maybe you’re looking to see if it helps your dog’s coat. Maybe your dog has allergies and you think it’s due to the food he or she is currently eating. But in July 2018, there had been a warning from the FDA about there being a great rise in dogs developing dilated cardiomyopathy, and it might have something to do with some of the grain-free foods. What does this mean? Does this mean that grain-free foods aren’t right for your dog? What grain-inclusive foods would be good for your dog then? But what about filler ingredients? Purina has been a mainstay when it comes to brand-names out there, and they’ve been making efforts to create dog foods that seek to create a more balanced nutrition for our lovely four-legged friends. In this particular dog food, you’ll notice that salmon is their #1 ingredient, so you can still count on your dog getting his or her share of protein. Following the salmon, there’s rice, barley, and oat meal along with some chicken by-product. In the end, your dog gets a fair amount of both protein and grains, along with a minimal amount of peas and carrots mixed in (but these two are much further down the list, so their amounts are almost negligible). 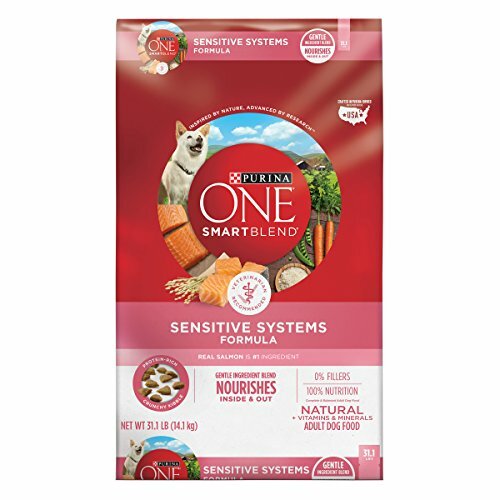 According to a Purina ONE representative, this dog food is compatible for both small breeds as well as large breeds, so whether you have a tiny Chihuahua or a Saint Bernard, this food should work well with them in providing a protein-rich diet that also has a balance of grains and nutrients. And best of all, it’s great for sensitive tummies! 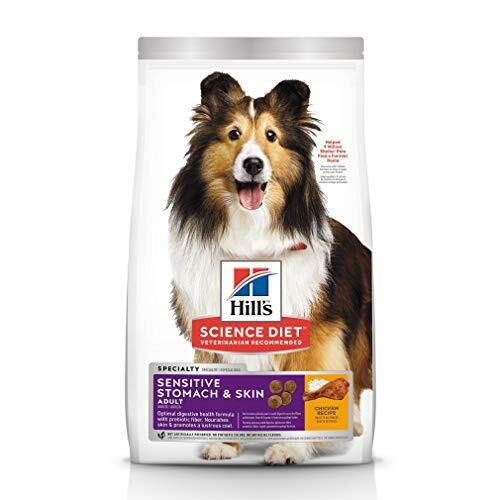 Hill’s Science Diet has been a strong name in the Veterinarian community and it has a lot to do with how well-formulated their pet foods are, as well as how effective they are when it comes to making foods for different types of pets. If you’re worried about your dog having tummy troubles or allergy problems due to feeding him or her different foods, this particular Hill’s Science Diet dog food would be a perfect one to trial feed your companion. You also won’t have to worry about artificial ingredients. With chicken meal as its main ingredient followed by rice, oats, and veggie proteins, you’ll know your dog is getting the important stuff, but furthermore, there are no artificial ingredients in this dog food. Everything that your dog eats from this is intended to directly contribute to your dog’s lasting health. You can thank your veterinary scientists for that! This should be on anyone’s list of the best grain inclusive dog foods. 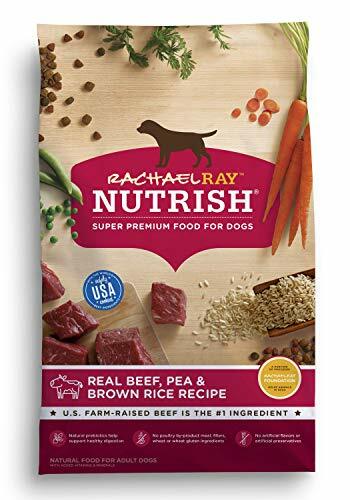 This dog food is the most affordable of this list, but it still maintains a strong list of ingredients with beef as its #1 ingredient. So, you’ll know that your dog is getting the protein it needs while still getting a nice balance of rice, peas, and ground corn. The beef is US farm-raised too, so you won’t need to worry about the meat coming from any source that isn’t as stringently checked. What’s more, this dog food is compatible for all dog ages that are able to chew solid foods, even weaning puppies. So, you won’t need to worry about buying several types of dog food, if you’re raising a little pup or puppies. And with each sale, a portion of this dog food’s proceeds to go the Rachael Ray Foundation for animals in need. So, you can feel good while you make your dog feel good. In light of what’s been going on with the grain-free food scare, the lesson can be that what dogs really need in their life is a balanced diet. Yes, protein is important for your dog, but their needs will change as they age. It’s the same as us humans when we age, our dietary needs may change, but all in all, a balance is still needed. That’s why grain-inclusive dog foods might be making a comeback as dog food producers are slowly learning to create dog food recipes that balance the distribution of meat protein along with grains and veggies. The days of filler ingredients may be on the decline now as we better understand the dietary needs of our four-legged best friends. The best way to determine what works for your dog, ultimately, is to see what literally works for your dog. Does your dog experience soft stool with a food? Does your dog end up vomiting? Does your dog get itchy and scratchy? Then it may be time to switch foods. But if you’re dog has a healthy coat and is as happy as can be without any displayed problems, then you might’ve found the dog food that is right for him or her. These three dog food choices work to establish that balance in ingredients to provide your dog with the nutrition he or she needs. They all can qualify as the best grain inclusive dog food. And they’re all at different price ranges, so no matter your wallet situation, you’ll be able to get your dog the best. Good luck! Which is the Best Dog Food for German Shepherds? Bowwowchownow.com is a participant in the Amazon Services LLC Associates Program, an affiliate advertising program designed to provide a means for sites to earn advertising fees by advertising and linking to amazon.com. Certain content that appears on this site comes from Amazon. This content is provided ‘as is’ and is subject to change or removal at any time.